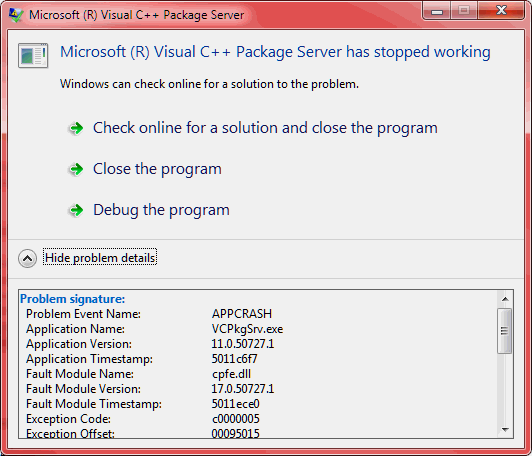 Great news for those suffering from Visual Studio 2010 IDE crashes with losing recent source code changes. Visual Studio 2012 is way more stable (event with Visual Studio 2010 Platform Toolset!) and suffers from crashes without losing editor changes. Which is an access violation or stack overflow issue in a child process, so that the crash does not kill the IDE itself. The problems seem to be all around cpfe.dll, and they are so less annoying. If you happen to experience anything of the kind, be sure to vote the bug report on MS Connect: Memory access violation and unhandled exception in cpfe.dll while editing C++ source code with Visual Studio 2012. Microsoft is still accepting feedback on this release and will hopefully resolve the problem in future VS 2012 updates.